While we still don’t know the fate of the origiinal CSI series yet, we do know that one of the franchise’s shows will be on the schedule next season. CBS has renewed newbie CSI: Cyber for a second season. 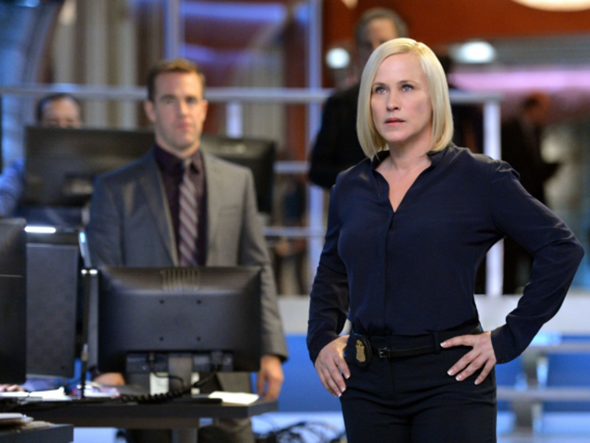 On CSI: Cyber, Special Agent Avery Ryan (Patricia Arquette) heads the Cyber Crime Division of the FBI. It’s a unit at the forefront of solving illegal activities that start in the mind, live online, and play out in the real world. This crime drama also features the talents of James Van Der Beek, Hayley Kiyoko, Charley Koontz, Shad Moss, and Peter MacNicol. ?Airing on Wednesday nights, CSI: Cyber has been averaging a 1.44 rating in the 18-49 demographic with 8.31 million viewers. Those aren’t stellar numbers but they’re apparently good enough for a CSI series to score a renewal (Stalker, which had a slightly better demo, has been cancelled). It likely doesn’t hurt that next season will be the original CSI’s final bow and the network wants to keep the franchise going. What do you think? Do you like the new CSI: Cyber series? Do you think it should have been cancelled or renewed? Did you like Stalker better? Please keep this show! I love it The. actors are super, and subject is very relevant. I would hate to see it cancelled. I really enjoy CSI Cyber and do not want to see it canceled. I am not fond of Patricia Arquette but have learned to deal with her. I liked the original character they took off to put on Ted Damson. If they had just left it alone it was good. I look forward to seeing it every week.